c) Movable beams under the direction of the officer commanding the heavy guns. Those at Fort Gilkicker fell into the last category. They were in use at Gilkicker for a very short period of time, probably from 1904 to 1906, although it is possible that they were retained for instructional use by the neaby School of Electric Lighting. The Electirc Light Stations are marked appear on the O.S. Maps of 1939 and 1950 but do not appear on earlier maps. 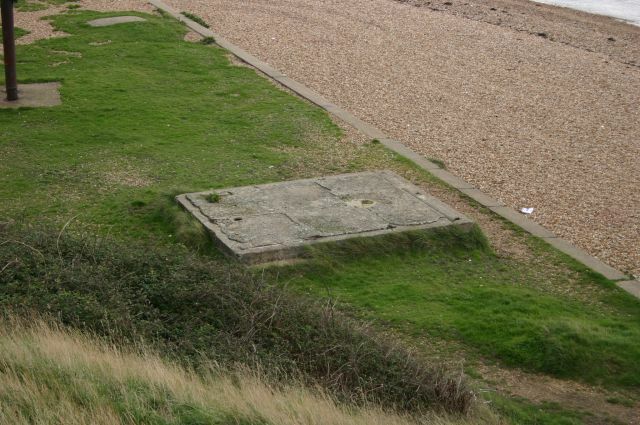 Concrete base no.1 for a coast Defence Electric Light (D.E.L.) to the east of Fort Gilkicker. 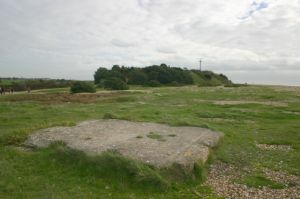 The same base as above viewed from the earth bank. Concrete base no.2 for a D.E.L. to the east of Fort Gilkicker. Concrete base no.4 for a D.E.L. to the west of Fort Gilkicker. 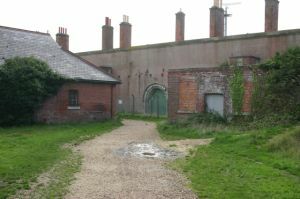 The Fitter's shop (right), later converted to an electricity sub-station. The Fitter's shop (right), later converted as an electricity sub-station. 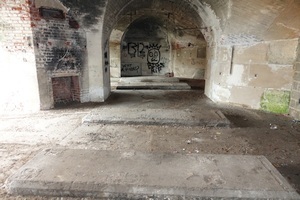 The concrete plinths in two of the Fort Gilkicker east casemates for four Crossley generators to power the searchlights. 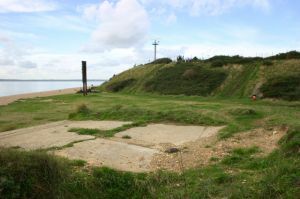 Another concrete base for searchlight no.3 lies to the immediate southwest of the earth embankment at the front of the fort but it is now obscured with earth. Fort Gilkicker: Concrete base no.1 viewed from the earth bank. Fort Gilkicker: Concrete base no.2 for a D.E.L. to the east of Fort Gilkicker. Fort Gilkicker: Concrete base no.4 for a D.E.L. to the west of Fort Gilkicker. 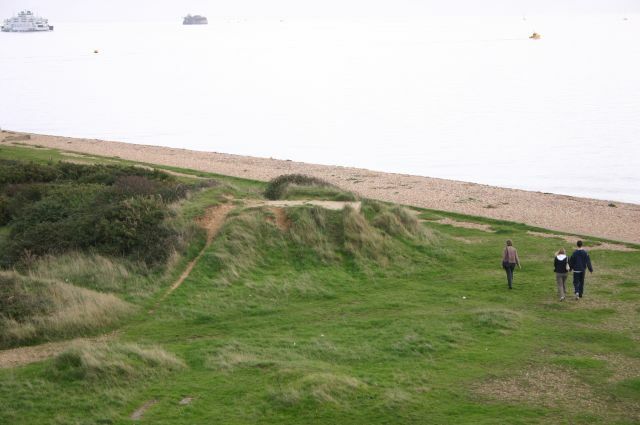 Fort Gilkicker: Imprint of the tramway in the tarmac of the approach road to Fort Gilkicker. Fort Gilkicker: The twin embankment upon which the tramlines ran into The Submarine Mining Establishment. 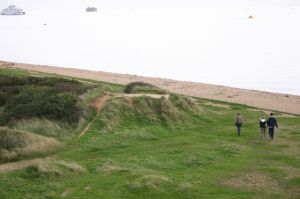 Fort Gilkicker: The tramway embankment running from the Submarine mining Establishment toward Fort Gilkicker. Fort Gilkicker: The Fitter's shop (right), later converted as an electricity sub-station. 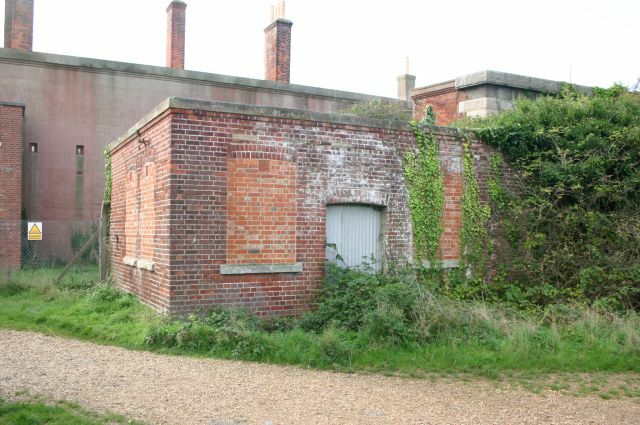 Fort Gilkicker: The Fitter's shop, converted as an electricity sub-station.